The New York Times and AP are carrying a story this week about a recent addition to the ambulances in the city of Fort Collins, Colorado: bike racks. … increasing numbers of cyclists who had bicycle accidents or medical emergencies while riding. Plus, ambulance workers were spending too much time going back to unlock the bikes once patients could retrieve them. I’ve thought about the “what if” scenario before – what would happen to my bike if I were hurt and taken away in an ambulance? I once had a medical issue while riding my bike. I was in graduate school, and I used my bike to commute to and from campus. I’d donated blood that day, and had been so busy I managed to miss lunch. As I turned a corner several blocks from home, the world started to close in around me – a dark tunnel with sparkling stars. Uh oh! I was going to pass out! I managed to get pulled over to the curb and laid down in the grass before I lost consciousness. I quickly felt better, but I was disturbed by the number of cars that passed by with no one bothering to check on me. Finally, a woman who lived across the street from where I lay came home in her minivan and rushed over to me. She walked me over to her front porch, plied me with fruit juice, and insisted on putting my bike in her van and driving me the rest of the way home. My little episode was thankfully not serious enough to require transportation to a hospital, but, if it had, I would definitely have felt better about my bike coming along with me, versus leaving it abandoned on the road, even if the bike cost only a couple of hundred dollars. It was my main form of transportation! Have any of you needed a ride to the hospital while out and about on two wheels? 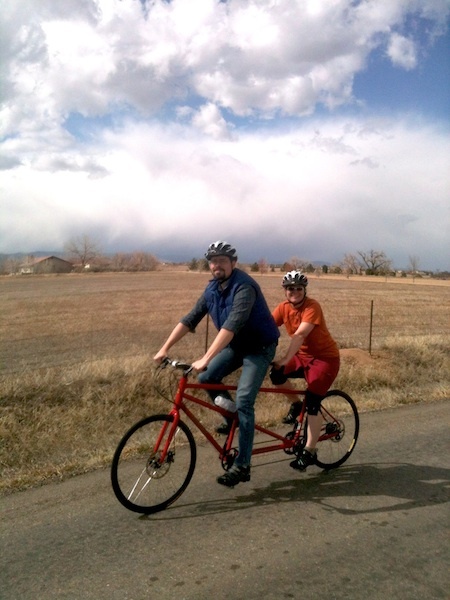 Bugman and I headed down to Denver for a weekend to pick up our brand-new Co-Motion Tandem. (Yippie!!) On the way home, we stopped to visit some friends and bike geeks (who own Cozy Cow Dairy – check them out!) 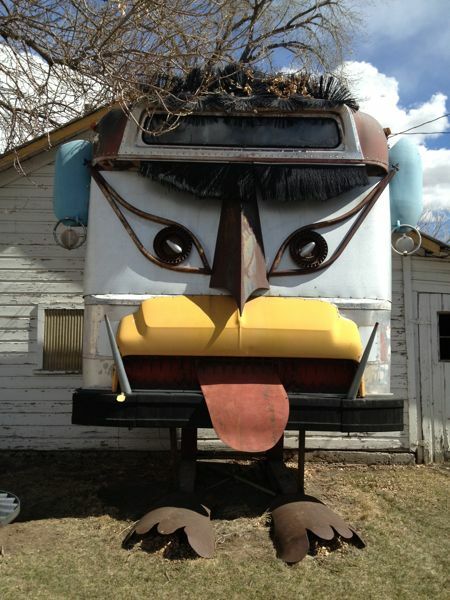 in Windsor, Colorado. They were kind enough to shepherd us along on our first long tandem ride. We’d had some practice on bike paths, and had advice from the bike shop (read it here). Still, I was a bit nervous being on the back, and kept trying to “steer” the bike at first. I finally figured out how to settle in and leave the driving to Bugman. 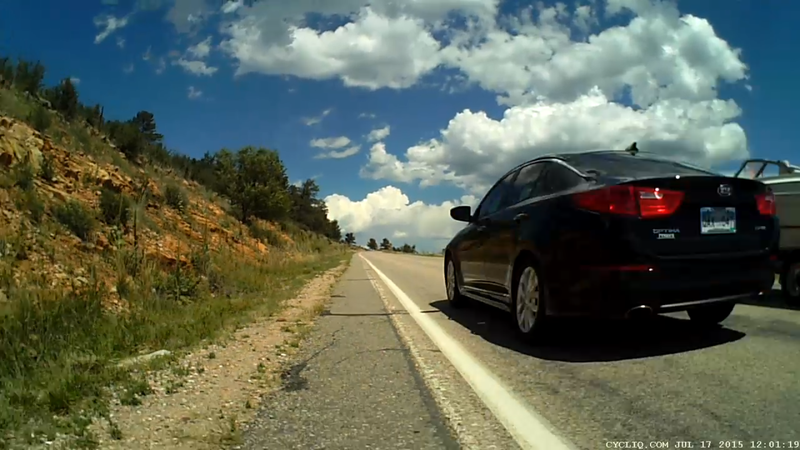 All I had to do was pedal and listen for Bugman’s signals to shift or stop. First, we pedaled out to the Swetsville Zoo, which turned out not to be a zoo but rather a delightfully quirky sculpture park. We timed things perfectly, arriving at the westernmost part of our journey – the crest of the bridge at the zoo entrance – just as a stiff wind kicked up and scoured us with road grit. Glad we didn’t have to bike into that wind the whole way! After a tour of the sculptures and a homemade energy bar snack, we pedaled on. Our first long tandem ride, and we’re all smiles! Yes, the wind was at our backs. BUT – see those clouds in the distance? It was some weather rolling in off the Rockies. We truly had “road mojo” on this day. We stopped at our second destination on the trip – High Hops Brewery – a fantastic combo of a brewery / hops farm / greenhouse / garden center. Just as we were settling down with a beer in the greenhouse, we heard a strange sound. Whew! That was lucky to have reached shelter just in time! We could even wheel our bikes into the greenhouse so they didn’t get wet. Then the noise got louder. I only just recently learned the term for this odd little snowball. We missed the main graupel fall, thank goodness, but we caught a little bit of it on our final (very cold!) leg of the ride. It stings when it hits bare flesh! The majority of our ride had been out on county roads – few stops, little traffic. Our final leg in town was probably the scariest part of the whole ride. 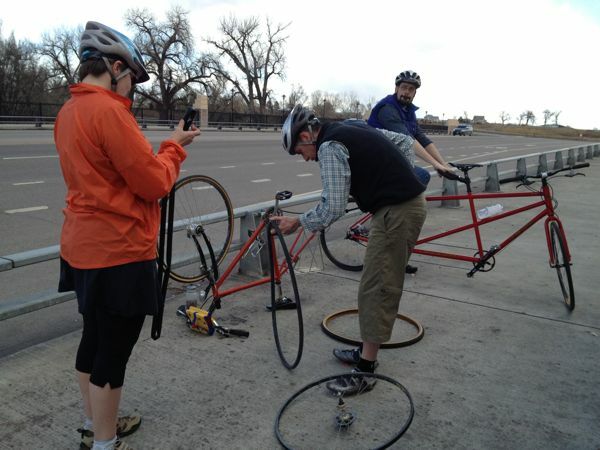 It takes us newbies extra time to start and stop a tandem, compared to our regular bikes. We also can’t turn as sharply as on a regular bike, and with such a long wheelbase, it takes longer to complete a turn. Riding in traffic is not real fun. We drove to a hamburger joint for dinner, then strapped the tandem atop the car and headed home to Nebraska, through 60 mph winds that closed some area highways. After that journey, we know the bike rack can stand up to just about anything!